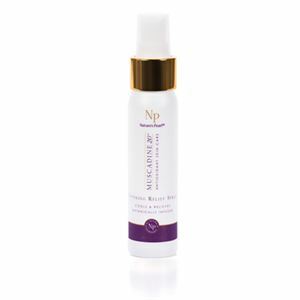 The Soothing Relief Spray is botanically infused to help cool and relieve troubled skin. 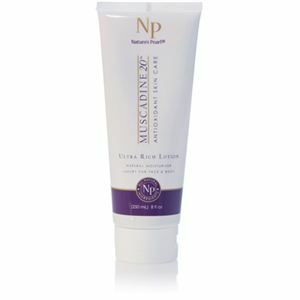 Nature’s Pearl® Muscadine 20 Antioxidant Skin and Personal Care are made from over 100 naturally occurring phenol compounds that provide you with unparalleled proprietary cosmeceutical skin and body products. They’re made with certified organic and wildcrafted ingredients that are perfect for all skin types.† Soothing Relief Spray is Certified ToxicFree®. Aqua (Water) & Montmorillonite Minerals [Epilobium angustifolium (Canadian willowherb)*, Olea europaea (Olive leaf), Aloe barbadensis (Aloe Vera) Gel*, Melaleuca alternifolia Leaf (Limonene & Allergy Free)*, Algae* & Artemisia vulgaris (Mugwort)*, Sodium Hyaluronate Acid (Plant Derived), Beta-glucan], Allantoin, Panthenol, Microcrystalline Cellulose, Maltodextrin, Hydrolyzed Vegetable Protein, Glycerin, Xanthan Gum*, Glucose & Lactoperoxidase & Glocose Oxidase, Helichrysum italicum (Immortelle) Essential Oil*.